Stochastic Wheel-Slip Compensation Based Robot Localization and Mapping, SIDHARTHAN, R. K., KANNAN, R., SRINIVASAN, S., BALAS, V. E.
A New V2G Control Strategy for Load Factor Improvement Using Smoothing Technique, CHANHOM, P., NUILERS, S., HATTI, N.
Remote Control of an Autonomous Robotic Platform Based on Eye Tracking, PASARICA, A., ANDRUSEAC, G. G., ADOCHIEI, I., ROTARIU, C., COSTIN, H., ADOCHIEI, F.
Enhanced Interrupt Response Time in the nMPRA based on Embedded Real Time Microcontrollers, GAITAN, N. C.
OZCANHAN, M. H. , UNLUTURK, M. S. , DALKILIC, G.
A pseudo-random number generator for low-cost RFID tags is presented. The scheme is simple, sequential and secure, yet has a high performance. Despite its lowest hardware complexity, our proposal represents a better alternative than previous proposals for low-cost tags. The scheme is based on the well-founded pseudo random number generator, Mersenne Twister. The proposed generator takes low-entropy seeds extracted from a physical characteristic of the tag and produces outputs that pass popular randomness tests. Contrarily, previous proposal tests are based on random number inputs from a popular online source, which are simply unavailable to tags. The high performance and satisfactory randomness of present work are supported by extensive test results and compared with similar previous works. Comparison using proven estimation formulae indicates that our proposal has the best hardware complexity, power consumption, and the least cost. C. M. Robert, "Radio frequency identification," Computers and Security, vol. 25, pp. 18-26, 2006. 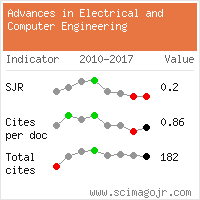 P. Peris-Lopez, J. C. Hernandez-Castro, J. M. Esteves-Tapiador, A. Ribagorda, "LAMED a PRNG for EPC Class-1 Generation-2 RFID Specification," Computer Standards & Interfaces, vol. 31, pp. 88-97, 2009. A. Manzalini, et al. "Self-optimized cognitive network of networks," The Computer Journal, vol. 54, pp. 189-195, 2011. H. Y. Chien, "SASI: A New Ultralightweight RFID authentication protocol providing strong authentication and strong integrity," Trans. on Dependable and Secure Computing, vol. 4, p. 337-340, 2007. J. H. Kong, L. M. Ang, K. P. Seng, "A comprehensive survey of modern symmetric cryptographic solutions for resource constrained environments," J. of Network and Computer Applications, vol. 49, pp. 15-50, 2015. H. Martin, et al. "AKARI-x: A pseudorandom number generator for secure lightweight systems," in Proc. 17th Int. On-Line Testing Symposium (IOLTS), pp. 228-233, 2011. M. Park, J. C. Rodgers, D. P. Lathrop, "True random number generation using CMOS Boolean chaotic oscillator," Microelectronics J., vol. 46, pp. 1364-1370, 2015. D. E. Holcomb, W. P. Burleson, K. Fu, "Power-Up SRAM state as an identifying fingerprint and source of true random numbers," Transactions on Computers, vol. 58, pp. 1198-1210, 2009. J. M. Segui, J. G. Alfaro, J. H. Joancomarti, "Analysis and improvement of a pseudorandom number generator for EPC Gen2 tag," in Proc. Financial Cryptography and Data Security 2010 Workshops, pp. 34-46, 2010. J. Chen, A. Miyaji, H. Sato, C. Su, "Improved lightweight pseudo-random number generators for the low-cost RFID tags," in Proc. IEEE Trustcom/BigDataSE/ISPA, vol. 1, pp. 17-24, 2015. P. Z. Wieczorek, "Lightweight TRNG based on multiphase timing of bistables," IEEE Transactions on Circuits and Systems I, vol. 63, pp.1043-1054, 2016. A. J. Menenez, P. C. Oorschot, S. A. Vanstone, Pseudorandom bits and sequences. Handbook of Applied Cryptography CRC Press, pp. 169-187, 1996. B. Alomair, L. Lazos, R. Poovendran. "Passive attacks on a class of authentication protocols for RFID," in Proc. Int. Conf. on Information Security and Cryptology - ICISC'07, pp. 102-115, 2007. M. Matsumoto, T. Nishimura, "Mersenne twister: a 623-dimensionally equidistributed uniform pseudo-random number generator," Transactions on Modeling and Computer Simulation, vol. 8, pp. 3-30, 1998. F. Panneton, P. LEcuyer, M. Matsumoto, "Mersenne twister: improved long-period generators based on linear recurrences modulo 2," Transactions on Mathematical Software, vol. 32, pp. 1-16, 2006. N. Saxena, J. Voris, "Data remanence effects on memory-based entropy collection for RFID systems," Int. J. of Information Security, vol. 10, pp. 213-222, 2011. A. P. Sample, et al. "Design of an RFID-based battery-free programmable sensing platform," IEEE Transactions on Instrumentation and Measurement vol. 57, pp. 2608-2615, 2008. D. Khovratovich, I. Nikolic, "Rotational cryptanalysis of ARX," Fast Software Encryption, pp. 333-346, 2010. R. Sedgewick. Algorithms in C, Parts 1-5 (Bundle): Fundamentals, Data Structures, Sorting, Searching, and Graph Algorithms, 3/e, Addison-Wesley Professional, pp: 55-86, 2002. 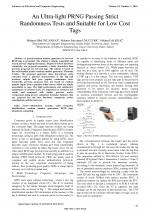 M. Feldhofer, S. Dominikus, J. Wolkerstorfer, "Strong authentication for RFID systems using the AES algorithm," in Proc. Cryptographic Hardware and Embedded Systems-CHES 2004, pp. 357-370, 2004. A. Moradi, A. Poschmann, "Lightweight cryptography and DPA countermeasures: a survey," in Proc. 14th Int. Conf. on Financial Cryptography and Data Security, pp. 68-79, 2010. C. Paar, A. Poschmann, M. J. B. Robshaw, "New designs in lightweight symmetric encryption," RFID Security: Techniques, Protocols and System-on-Chip Design, pp. 349-371, 2009. P. Peris-Lopez, P. T. Lim, T. Li, "Providing stronger authentication at a low-cost to RFID tags operating under the EPCglobal framework," in Proc. Embedded and Ubiquitous Computing Conference, pp. 159-167, 2008. M. Feldhofer, J. Wolkerstorfer, "Hardware implementation of symmetric algorithms for RFID security," RFID Security: Techniques, Protocols and System-on-Chip Design, vol. 3, pp. 373-415, 2009. H. Martin, P. Periz-Lopez, J. E. Tapiador, E. San Millan, "An estimator for the ASIC footprint area of lightweight cryptographic algorithms," IEEE Trans. on Industrial Informatics, vol. 10, pp. 1216-1225, 2014. H. Martin, E. San Millan, P. Periz-Lopez, J. E. Tapiador, "Efficient ASIC implementation and analysis of two EPC-C1G2 RFID authentication protocols," Sensors, vol. 13, pp. 3537-3547, 2013. J. Melia-Segui, J. Garcia-Alfaro, J. Herrera-Joancomarti, "Multiple-polynomial LFSR based pseudorandom number generator for EPC Gen2 RFID tags," in Proc. 37th Annual Conference on IEEE Industrial Electronics Society, pp. 3820-3825, 2011. J. Walker. Randomness battery, 1998. [Online]. Available: http://www.fourmilab.ch/random/. P. Kohlbrenner, K. Gaj, "An embedded true random number generator for fpgas," Proc. 12th International symposium on Field programmable gate arrays, pp. 71-78, 2004. Citations for references updated on 2019-04-21 23:11 in 116 seconds. Website conception, design and maintenance by Eugen COCA. Content updated on 28 Feb 2019. Site engine updated on 28 Feb 2019. This page was generated on the server in 0.019 seconds and loaded in your browser in > seconds.